Nucleus Review 2019: Is Nucleus a Good Hosting? Nucleus is a Belgium-based website hosting provider offering a choice of Windows and Linux operating systems. The plans are expensive, but the team includes industry experts. 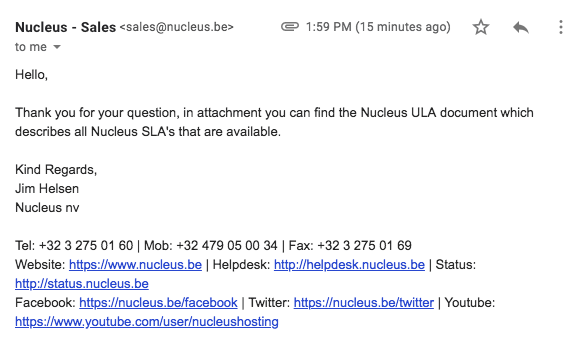 Founded in 2000, Nucleus is a Belgium-based company offering a unique “uptime-as-a-service” package. The website’s available in English and Dutch. Nucleus has its servers co-located in multiple Tier III Belgian data centers. That should mean you get less than 1.6 hours of downtime per year. The company is ISO 27001:2013 certificated for data security and has clear corporate social responsibility guidelines. It’s quite interesting; the company is clearly extremely passionate about its uptime (there’s even a dedicated service called “uptime-as-a-service”), however I wasn’t able to access the SLA page on the website. I followed up with support, who sent me its uptime SLA document. Unfortunately, the uptime guarantee for shared hosting is “best effort”. When you are choosing a shared hosting plan, you have the option to choose between Windows or Linux as your operating system. The plans support ASP .NET (versions 1.1, 2, 3.5, 4) and PHP (versions 5 through 7) respectively, along with all the regular databases e.g., MySQL and Microsoft SQL. If you’re a beginner, the situation is less clear. The plans do support the standard CMS programs like Drupal, Joomla!, and WordPress, but neither a one-click installer nor a website building tool are clearly advertised on the website. Given the level of value-added features is not particularly high and the resource quotas are low, the prices do seem expensive. Having said that, this is a Belgian company, so the local prices are higher than similar companies around the world. When you checkout, it becomes apparent that you need to purchase an annual plan. There’s no option to buy a month-to-month plan at all, which is pretty restrictive. There also isn’t a money-back guarantee, so you really are making a big investment when you start. If you want to contact the team, you are limited to an online contact form from what is easily accessible. The site also states that there is support via phone and email, but that information seems harder to locate. There’s a large knowledge base with tons of useful documents, however, ideally, I’d like to see more ways to get in touch. I contacted the team mid-afternoon on a weekday via the online contact form. I wanted to get more information about the uptime SLA. I was pleased to receive a detailed response within one business day. Nucleus provides a wide range of services, which span regular shared hosting all the way to consulting and advisory services. The plans are expensive and it’s hard to understand the uptime proposition, but this company takes social responsibility seriously and it’s clearly run by industry experts. Buy Belgian hosting now at Nucleus! Wondering how Nucleus stacks up against other Web Hosting companies? Enter any other Web Hosting company and we will give you a side-by-side comparison.